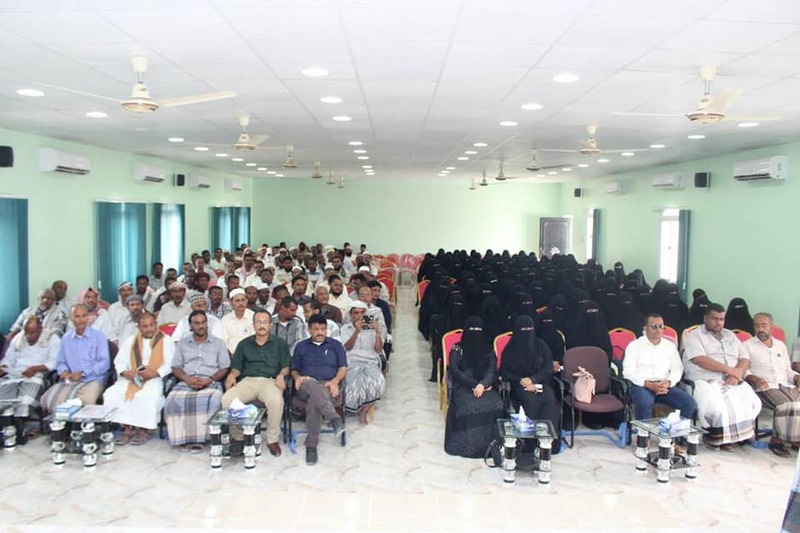 The ceremony on February 24 marked the conclusion of the training course for (258) teachers on active learning for grades 4 to 12 with support of SFD and in coordination with the Office of the Ministry of Education in Alshihr – Hadramout. The activity has tended to build the capacities and improve performance of the teachers..
Chargé d'affaires of SFD director in Hadramout Mr. Awad Leqsam gave a speech during which he called on the trainees to reflect what they had attained during the training course on the educational process positively. Eng. Amin Saeed Barzeeq, Director General of Al-Shahr District on his part confirmed on the training in pushing education ahead in the governorate, and he noted to the previous SFD course for teachers for grades 1 to 3. The 12-day training targeted 258 teachers School and included skills in classroom management, human and social relations in the classroom, learning environment, learning problems, and classroom rules.